Windows Live Mail - inline images: what if you DONT want to embed them? Outlook Express was a much maligned piece of software, but it had a great feature - it could edit emails in a WYSIWYG fashion, and save them as a plain text >EML file. This was good news for us techies, because it meant that people that had to create emails for bulk mailing had an editor that was freely available on any XP machine. In these days of Windows 7 and above, Outlook Express has long gine, and has been replaced with Windows Mail. It has the same sort of features, but it lacks a major feature of Outlook Express - the ability to send inline references to images, rather than embedding the image in the email. This ment that the email created was a lovely small size, yet could still look fabulous by referencing images on your external website. Now all you have to do, is place an HTML image link to the image you want to display inline in your email e.g. The key is the "3D" bit in front of the quotes - Windows Live Mail uses "quoted printable" encoding, which means that "=" is the same as a carriage return - "3D" is the same as "="! So, let’s cut to the chase –just how good are they? 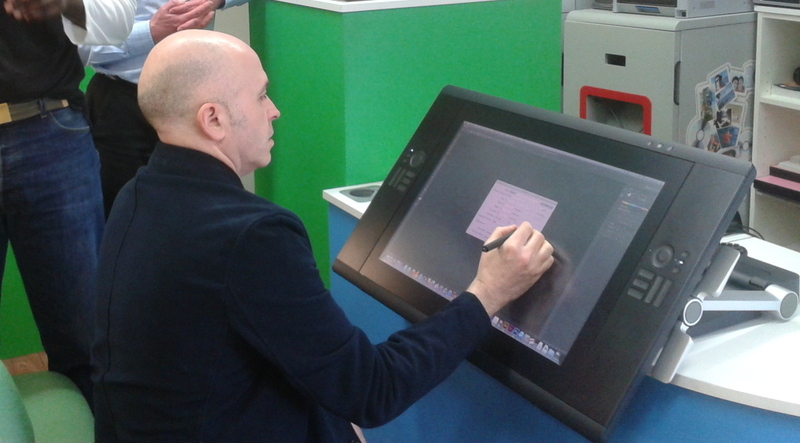 The 24HD (with touch) is the flagship of the Cintiq range. For those of you that have never seen a Cintiq, you’ll see from the pictures that it looks like a large drawing board – which is basically what it is – but it’s also a computer screen. This means that by using the pen supplied, you can draw on the screen as if you were drawing on paper (with the right software). Because the Cintiqs are input devices, they can be used with any computer that supports them (this includes Macs & PCs) - DPS’s Mac had Photoshop installed, which we used to try out the various features. The 24HD comes with 10 configurable express keys, and two configurable touch rings. The touch rings on our demo were set to rotate the page in Photoshop - a lovely little idea, which would also work well in Manga Studio, but as with almost everything with the Cintiqs, you can set them up (as well as the express keys) to do what you want in the Wacom Driver control panel. As I’ve used something similar before, I suggested that Pete have the first real play with the device. Pete uses an Intuos 2 tablet professionally, so I wanted to see long it would take for him to become comfortable with the Cintiq – the answer was, extremely quickly. If the version of Photoshop had been the same as Pete was used to, it would have been quicker still. From my own experience, I can report that the 24HD performs well – pen point mapping was good, and there is very little pointer offset (the distance between the point of the pen and the pointer on the screen under the glass). The “Touch” option is an interesting feature. In short, WACOM has given the 24HD both a pen enabled screen, and a virtual capacitive touch screen - which one you use depends on where the pen is. If the pen is near the screen, the standard pen-enabled features work, if the pen falls outside the screen’s range, the capacitive screen takes over. This means you can do things like rotate the screen with your fingers, pinch to zoom etc… It’s a nice idea, which nearly works – I found that it misfired a few times when I was drawing – but you can turn it off if it becomes annoying. 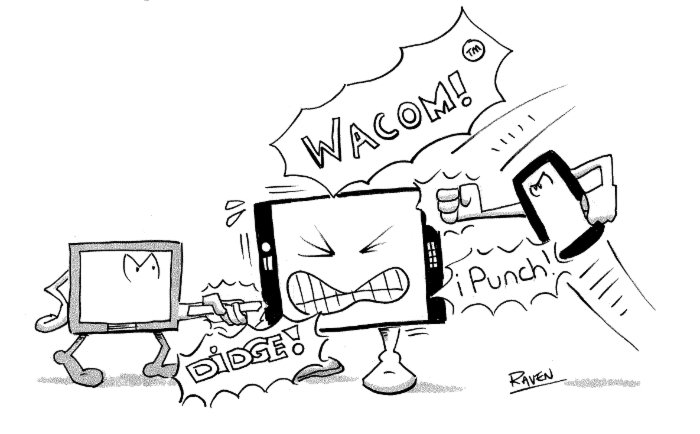 Everything else was as you’d expect from WACOM. Good pressure sensitivity, responds well, and is easy to work at for long periods. 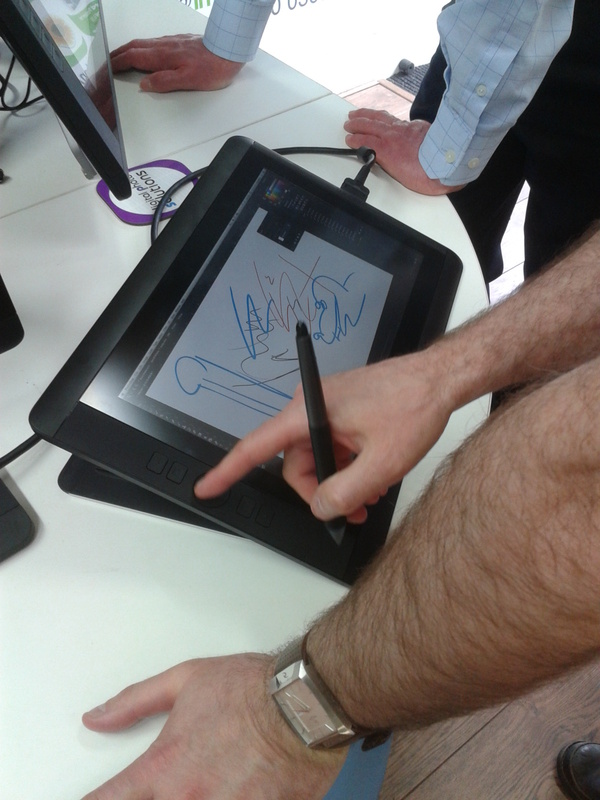 In summary, the Cintiq 24HD is a quality product, designed for (and intended for) studio use. The Cintiq 22 is essentially the same device, minus the touch facility and the touch rings, so I won’t bother to elaborate much – it is however, much neater, and may suit your needs better than the larger 24 HD, so compare before you buy. 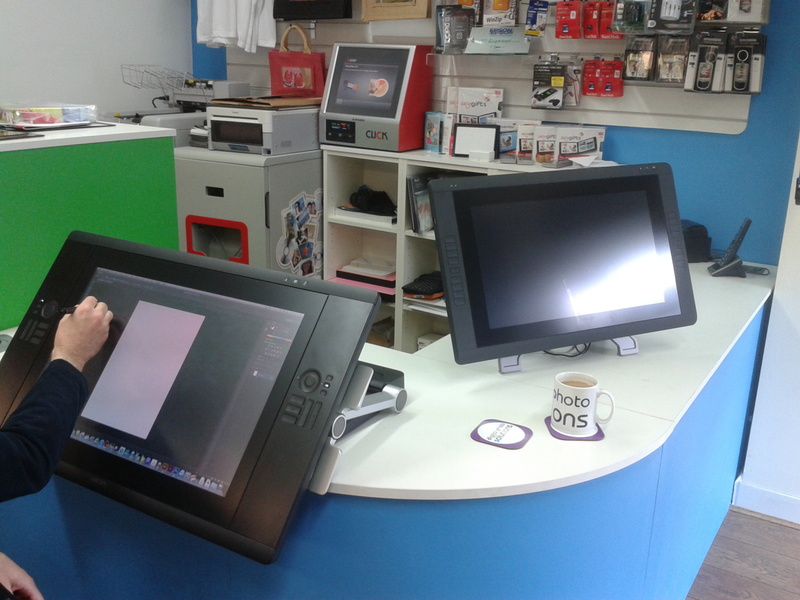 Although the baby of the range, the 13HD is the entry level Cintiq, and replaces the 12W – comparison of the two devices is therefore inevitableJ. The 13HD has a 1920 x 1080 pixel screen, which really is razor sharp, as well as having a wide screen aspect ratio. WACOM have slightly changed the pen for this display (it’s slightly thinner), but it still uses the same technology, so the pens are interchangeable across the Cintiq range (as an aside, the modern cintiqs can use pens from the Intuos 4 range of tablets, or above). There is no “touch” option available, but there are the usual programmable controls that are almost as good as its big 24” brother. The biggest improvement to the baby Cintiq is in the area of cabling. The original 12W had a large converter box to which you plugged in your cables – now, the cables are direct into the device – power, USB and HDMI. Yup, that’s HDMI, not VGA or DVI – you’ll need an adapter to use those (between £10-£20). To be fair, it’s better for it, as the 13HD feels slimmer and lighter – it also comes with a pretty good stand. Overall then, the 13HD is a worthy replacement for the 12W, but is it worth replacing your 12W with a 13HD? To be honest, I think not, unless you REALLY need to get rid of that converter box. 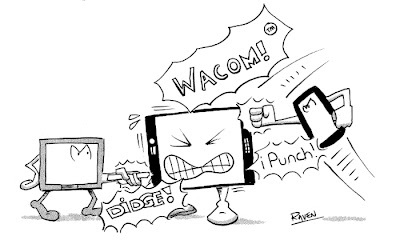 Some people have asked my how the Cintiq range compares to the DTH or PL product lines that they do, especially as they look similar, and have comparable features, so I asked David Oduro of WACOM about it. The answer is that the DTH & PL lines are interactive displays, and are designed to be used for short periods, not day in / day out for weeks on end. If used that way, they can cause headaches etc., whereas the Cintiq range is designed for continual safe usage for as long as the artist requires. Firstly, thanks to fellow CCGB member Pete Ellis for his contribution. Secondly a big thank you to David Oduro of WACOM for the technical knowhow (he really knows his stuff) and Dave Harrison of DPS for the venue and demo equipment. DPS are one of WACOM’s main distributors in the south, so if you want a good deal, please call him on 020 8460 3690, or by email at dharrison@dpsb.co.uk – and don’t forget to mention the CCGB – you might get a discount! Android (as a phone operating system) is crap. 9 months ago I moved from a pay and go setup for my phone (at the time, a Sony Xperia Mini Pro android based setup) to a contract, and got a new phone as part of the deal, a Samsung Galaxy Ace. My wife, who moved onto a contract at the same time, chose to stick with Blackberry, and got a 9320. In the last 9 months, I have sworn about lack of android updates for my phone. I have fought with a system that can sometimes take over a minute just to make a phone call. I have tried (unsuccessfully) to get voice dialing working, and to get a decent signal in some areas. In short, I was at the end of my tether. To cap it all, I went to a medieval fair, and tried to take some pictures - now remember than my Galaxy has a good camera, but it took so long to set the camera up that I lost the shots - my wife on the other hand, had taken 5 shots using her Blackberry, and pretty good they were too. Last week in desperation, I tried putting my Sim into a battered old Blackberry 8250 that we had lying about the house, and the difference was astounding. My calls were clearer, I had more signal, making a call was measured in seconds (not minutes), and I could also voice dial whilst connected to a hands free headset. In short, this knackered old blackberry smart phone wiped the floor with my Samsung. Don't get me wrong, not everything in the garden is Rosy. At the moment, I'm still having to use the Samsung as I need email access, and I can't get the Blackberry set up on Virgin for some reason, but it goes to show that as phones have progressed, sometimes android has not followed. You could blame this on inferior hardware (and you might have a point), but I believe that android has come too far, too fast - and the cracks are showing. At the end of the day, if even the most basic android phone can't compete with a knackered, water soaked old Blackberry on equal terms, then something is fundamentally wrong. Graphics Tablets - Mightier than the Mouse? "MIGHTY MOUSE IS ON HIS WAAAAAAAAY! HERE I COME TO AAARRRGGGHH!!!" Back in days of yore, ye olde scribes of merriment and hilarity would scritch away on their parchments with trusty metal pen nibs, bringing to life their array of humorous characters for the delectation of the common man. Ink would blot, spit and spill, and verily, they said unto themselves "Bugger this for a lark - I'm going down the pub..."
But enough about the golden age of Fleet Street. Today's cartoonists are more modern, dynamic, and techno-savvy (yeah, right). They have embraced the Digital Age, and that's primarily because of one invention - the graphics tablet. Never before, in the field of humorous endeavour, have so many grumpy old gits work flow been transformed by one device. So what is a graphics tablet, what does it do, and how can it help the average cartoonist/artist? Mice were fine for a fair number of years - then some bright spark said "what if we could do the same thing as a mouse, but use a...PEN! You could..WRITE...maybe...DRAW! MY GOD - it would be BEAUTIFUL..."
Well, sort of. For anyone used to drawing on paper, using a graphics tablet is a bit of a learning curve, because although the pad represents the screen, it does not occupy the same physical space (it's sitting on your desk, after all) - this can lead to a sense of "detachment" when using the pen to draw. The tablet manufacturers realised that what people wanted was a way they could use the pen by drawing on the screen. "What if" said an engineer "we put a digitizer behind a LCD screen..."
Our engineer is a busy old bee, and comes up with another bright idea -" put the digitizer and pen in a laptop..." - and the Tablet PC was born. These devices are as portable as laptop (sometimes more so), and have all the advantages of a hybrid, but are truly portable, as well as being fully functional PCs. Unfortunately, only a few manufacturers ever made them, and their initial cost was too steep, but second hand, these devices are exceptionally good value for the cartoonist. The first generation of Tablet PCs in the Naughties did lead the way for another type of device - the ultra-portable "Pad" device, the best example of which is the Apple iPad. Unlike a Tablet PC, the Pad has a touch-sensitive screen which the user works with their fingers - they point, the pointer moves, they tap, they generate an action. Most touch screens use "capacitive" technology (that is, the screen is conductive to electricity). The screen in normal use, produces an electrical field, which is distorted when a conductive material (such as the skin on your finger, or a stylus) is brought into contact with it. These devices are usually not sensitive to pressure, or able to work in extreme detail, but these limitations will only be temporary, as the technology continues to develop at a staggering pace.